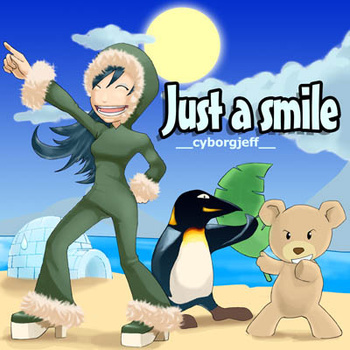 One year after the album "Popbuster", Cyborg Jeff is back with a fresher album "Just a Smile". At the beginning, it would be just a 5 titles album centred around the two tracks "A smile on your face" and Miss Eskimo. All started during a chat time with my friend K93 (Steve Kossouho) about the cover of the single "A smile on your face", then arrived the idea of a Miss Eskimo, and some minutes later, Cyborg Jeff started to write the song ! The 14 tracks and the bonus was written to be closer than that ambiance and sound experience. This time not a lot of tracks written with other musician. For instance you'll hear Naked on a blue sky, a trance remix of the french musician GDream. You'll also discover a remix of the Nintendo game Donkey Kong Country 2 and something mixing Marc Lavoine with C64 audio promotion. Finally, this album was the first completly written under Jeskola Buzz Tracker !